Nerdy Derby 2013 « Adafruit Industries – Makers, hackers, artists, designers and engineers! 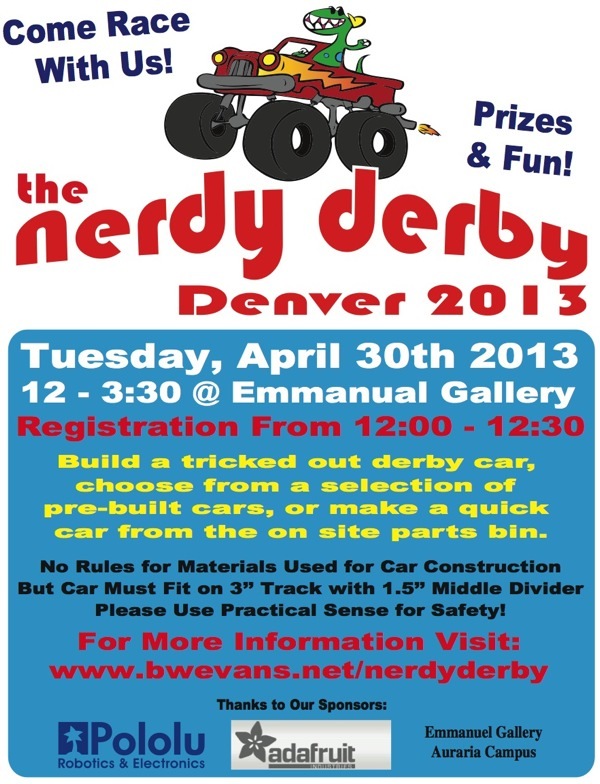 Nerdy Derby Denver is a non-regulation miniature car building and racing competition inspired by the Cub Scouts’ Pinewood Derby and the first ever Nerdy Derby in NYC. With a larger, more undulating track and no restrictions on the size of the cars (as long as they fit on the track) or materials participants can use (as long as they are safe), the Nerdy Derby rewards creativity, cleverness and ingenuity. The inaugural Nerdy Derby Denver will take place at the Emmanuel Gallery on Tuesday April 30on the Auraria Campus as part of Performance Art Week. Visitors can bring their own cars to race and stick around to watch.